The 18 firms listed below have been announced as winners of the 2018 Analyst Firm Awards. Full details are set for release on September 10. The 2018 Analyst Firm Awards (AFA) use an improved methodology that rewards the valuable advisory and analyst firms that users rely on the most. The annual awards, which reflect users’ responses to Kea Company’s Analyst Value Survey, span six categories. The awards are presented annually at a launch lunch, this year at central London’s Royal Society of Medicine. As a group, the 18 winners produced almost 80% of all the value produced by analyst firms in the 2017-18 survey. 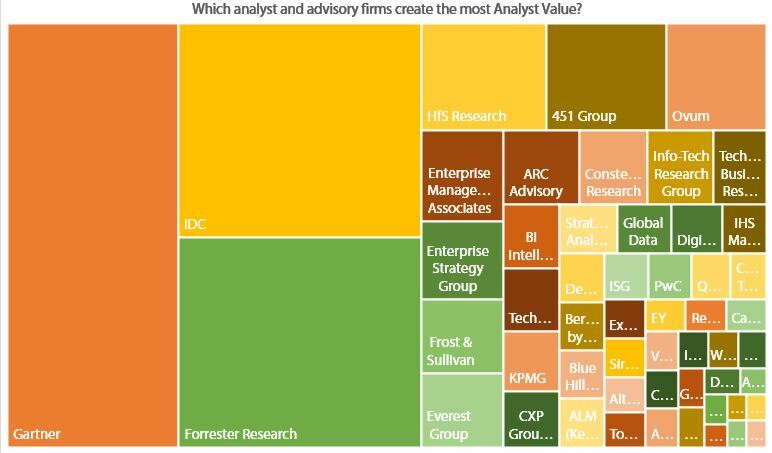 Indeed, just three firms (Gartner, IDC and Forrester) together produced just over half all analyst value. As in previous years, two factors drive the success of firms in the AFA: the number of users, and the value they gain from the firms they use. In the 2018 award, two methodological tweaks show this value more clearly by also showing reliance. A professional is said to rely on an analyst firm if it’s one of the few firms they use most, or if they generate a relatively high value from a smaller than expected group of analyst firms. Firstly, the new method boosts the firms that are used most deeply. There are many reasons why the number of firms used by professionals grows, but two significant elements are the rising firewalls around premium content and the growing involvement in the purchasing of line-of-business managers who typically cannot access premium content. Many managers, and especially those involved in product selection and evaluation, are using up to a dozen firms’ insight. In the 2018 AVS, the results give much higher weight to the three or four firms the professional uses the most. Secondly, buyers are more reliant on a firm if there are few substitutes for it. If one manager heavily uses two analyst firms, and another is a heavy user of four, then the first manager is more reliant on those two firms. Often this reflects the use of specialized analysts firms. These tweaks work together to show that some firms are less valuable than their readership and awareness might suggest. In particular, Frost & Sullivan, Aberdeen Group, Datamonitor and advisory firms like Deloitte, PwC and EY are widely used, but professionals are not highly reliant on their research. The new method is better at spotlighting the high value produced by firms that managers rely on heavily. Unsurprisingly this includes Gartner, Forrester and IDC but also some hard-to-substitute providers (like BI Intelligence, CXP Group, Global Data and KupplingerCole) punch above their weight.